The rise of advanced analytics in the oil and gas industry has resulted in great efficiency gains especially in the area of automated field/reservoir diagnostics. However, the solution space is still labor intensive, mired in subjective geologic interpretations and hindered by the lack of interdisciplinary data integration. In this webinar, we present a fully streamlined framework that aims at building a comprehensive opportunity inventory guided by reservoir management principles. The generated inventory consists of behind-pipe recompletion opportunities, vertical new drill locations, sidetrack opportunities, and optimal deviated/horizontal targets. 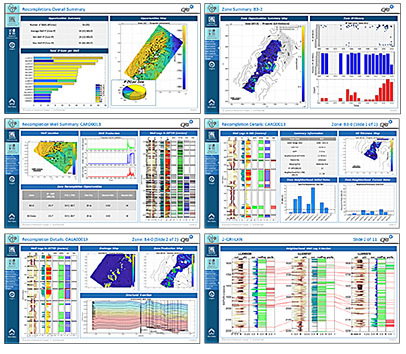 This technology automates best-practice geologic/engineering workflows using a series of computational and data-driven algorithms to solve the various sub-problems encountered in the process of opportunity identification including remaining pay interpretation, drainage analysis, optimized target search, production forecast, risk assessment, interference optimization, and so on. As a result, this framework delivers an initial opportunity inventory in a very short timeframe and allows for several updates, iterations, and scenarios to be considered which ultimately improves the overall accuracy and quality of the final opportunity catalog. Energy Industry Professionals: geoscientists and engineers involved in opportunity identification work and searching for ways to streamline/accelerate field development planning. Data scientists/engineers/analysts and anyone looking for practical applications of data analytics and machine learning in the process of automating time-consuming geological workflows. Tech pioneers/executives interested in seeing the future potential of smart virtual assistant technology in providing a seamless and natural access to integrated O&G data and associated insights. With a bachelor's in computer science and a master's in geology, Wassim Benhallam uses his interdisciplinary skills to develop fast, automated, and data-driven solutions that incorporate geological and engineering data to prescribe how to maximize oil production. Since joining QRI, he has had the opportunity to deploy these technologies to identify workovers/recompletion opportunities and new drill locations in various oil fields in the Middle East, California, and Mexico. Mr. Benhallam also uses his quantitative background to develop cloud-based virtual assistant applications leveraging the latest machine learning (NLU) models and web technology to assist engineers and geoscientists in querying subsurface data, investigating reservoir problems, and extracting insights. During his graduate studies, he conducted multi-scale point pattern analysis of channel-belt sand bodies from the Straight Cliffs Formation in Utah and developed photorealistic outcrop models using DEM reconstruction from large LiDAR point clouds that can be used as quantitative inputs into reservoir models.